A and P stands for Agricultural and Pastoral Association Show. The first show was held by the Canterbury Agricultural and Pastoral Association Show at a farm. 28 pens of sheep were judged. The next year a more successful show was held near Ashburton. In 1862 the first show was held just north of Latimer Square. The following year the Agricultural and Pastoral Association was founded and brought 14 acres in Sydenham. This became Sydenham Park. In 1866 the different breeds of sheep were judged separately. 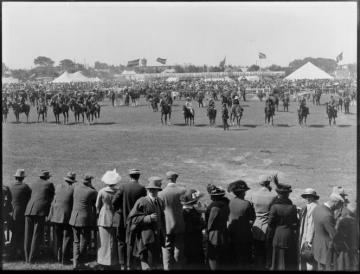 In the same year Rangiora and Timaru also held shows and through their popularity the Agricultural and Pastoral Association Shows were getting bigger. When the Sydenham site became too small, they moved the location to Addington where it is now. The first show ran 9 to the 11 November 1887. The were more categories like sheep, pigs, cattle, and horses as well as farm produce and equipment.